The Sports Car had a belt drive to the rear wheels, front vertical grill, two tiny windscreens and a hood. Notice that the doors open from the inside; no external handles. The handle above the door is most likely a gear change or hand-brake. The hole in the bonnet is for the petrol cap. The Saloon car has chain drive to the rear wheels, and with its white tyres is a bit of a monster! The Bakers Van has the drive to the rear wheels obscured. Notice the 'Wherwell' badge on the front, two tiny lights on the front wheel mudguards (not very illuminating?). The rear wheel, on the offside only, seems to have a circular metal band just inside it (brakes possibly). The Sports Car has a more domed bodywork shape, and appears to be without any windscreens. It does have a hood and a 'Wherwell' badge. All four cars have the same number plate! 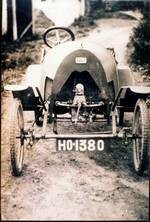 It is believed that the chassis' were built from an ash wood frame with sheet metal beaten over the top. The engine was a two-cylinder horizontally-opposed Vicars (Vickers ?) engine bought from the manufacturer. The Wherwell automobiles were built by the Thompson family. William Thompson served in the Royal Navy, based in Portsmouth, from 1879 until 1899, when after 20-years service he retired as a Chief Artificer. His son Ray was born in Portsmouth and educated at King Edward VI School in Guildford, Surrey, where they lived for some time. Ray became an apprentice at Dennis Brothers, well known for Buses and Fire Engines. Whilst there, he designed a system for cooling engine water by passing it through a tube with heat dissipating vanes attached; akin to the radiators in many cars today. This information originated from Mark Pallot in 1997, a grand-son of Ray Thompson.